Crispy on the outside, ooey, gooey, and ever so cheesy on the inside! 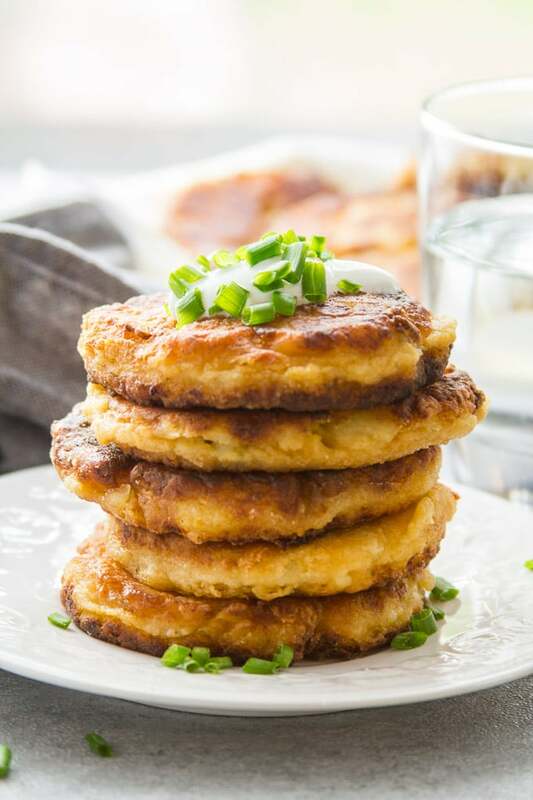 These vegan potato pancakes are indulgent, super easy to whip up, and perfect for using leftover mashed potatoes. This recipe is for your leftover Thanksgiving mashed potatoes! Because I know this is exactly what you want for the day after a big indulgent meal: fried carbs. In any event, if you find yourself with lots of Thanksgiving leftovers, you’re probably going to be eating lots of carbs for a few days anyway. The fried part is just a bonus you get with this particular recipe. So that was kind of my logic when I came up with this one. Also, maybe you’ve got holiday houseguests for the weekend and need something fun to serve up for breakfast? 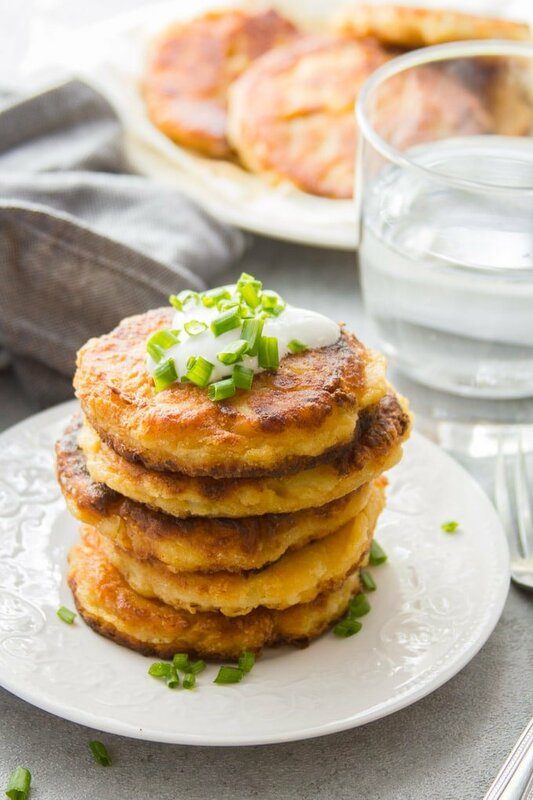 Mashed potato pancakes are great for breakfast! You can use just about any old mashed potatoes for this dish. I used what was left of my truffled mashed potatoes, and they worked great. But if you made some other mashed potato recipe for the holiday (no hard feelings), go right ahead and make your cakes out of that. Whatever mashed potatoes you use for these cakes, make sure they’re chilled. I’m guessing most of you chill your leftovers, but just in case you ran out of room in the fridge or whatever, I figured I should let you know! 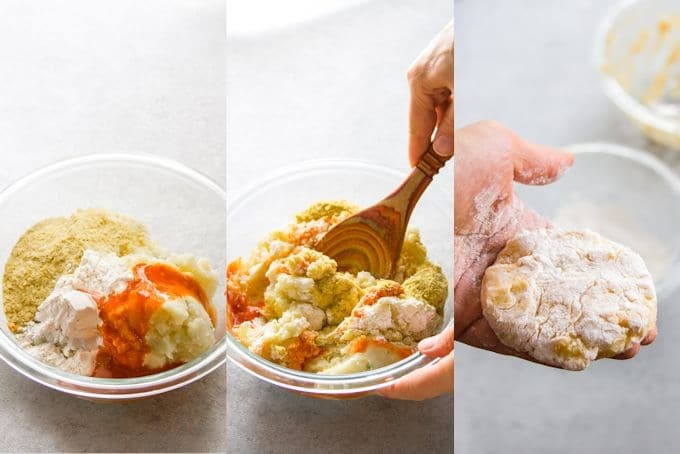 Mix up your leftover potatoes with some flour, hot sauce, and nutritional yeast. The flour binds the cakes, while the hot sauce and nooch make them taste cheesy. Heat some oil in a skillet, then use floured hands to shape some pancakes and dredge them in flour. Fry the pancakes for a few minutes on each side. Transfer them to a paper towel-lined plate to drain the excess oil. Serve with your favorite toppings. I went with a little unflavored non-dairy yogurt and some chives, but cashew cream, avocado slices or salsa would be excellent as well. Since mashed potato recipes vary in terms of moisture content, you may need to adjust the amount of flour a bit. 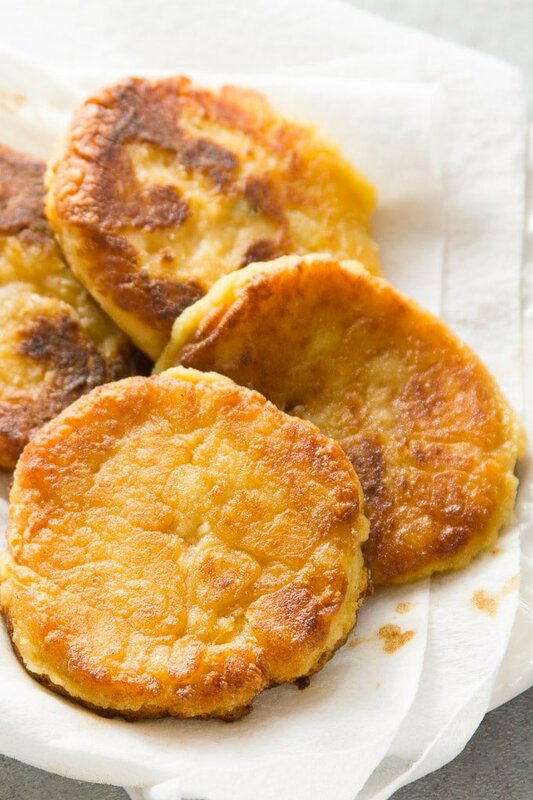 The colder the potato pancake mixture, the easier it is to work with. I like to keep it in the refrigerator, or even the freezer, between cooking batches of the pancakes. 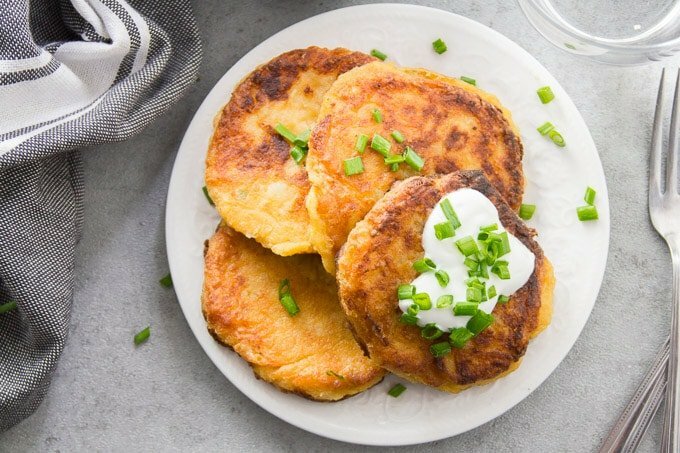 Since there’s no egg in this recipe, the base is quite a bit more delicate than the mixture you’d use to make traditional potato pancakes. Keep that in mind and be careful when shaping and handling the pancakes. Keep a bowl of flour handy and flour your hands to keep the potato mixture from sticking to them. Can these be made gluten-free? I’m not sure! But I suspect something like chickpea or oat flour would work as a substitution for the all-purpose flour in this recipe. These are best served immediately, but if you need to reheat some leftovers, just place them under the broiler for a few minute until they start to crisp back up. Place 1/2 cup of flour into a small bowl. In a separate, large mixing bowl, stir together the mashed potatoes, another 1/2 cup of flour, nutritional yeast, and hot sauce. If the mixture seems too soft, add a few more tablespoons of flour. Add 1/4 cup of oil to a medium nonstick skillet and place it over medium heat. Allow the oil to heat up for minute or two. When the oil becomes shimmery, shape about 1/4 cup of the mashed potato mixture into a patty, then carefully dredge both sides in the flour. Carefully place the patty in the skillet. Repeat and add a few more patties to the skillet if they'll fit, but be careful not to crowd them. 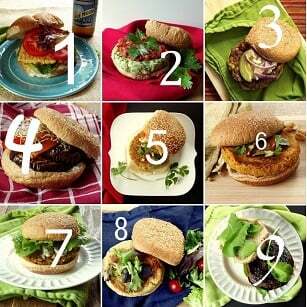 Place the remaining potato mixture in the fridge or freezer to chill while the patties cook. 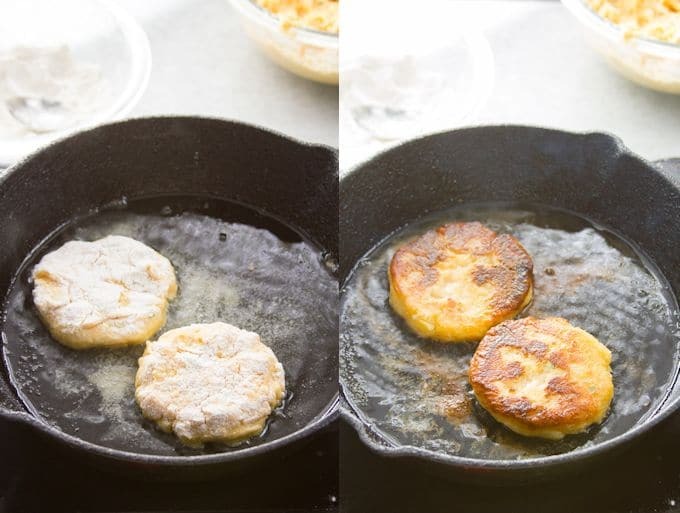 Cook the patties for 3-4 minutes on each side, flipping carefully between sides. Transfer the cooked patties to a paper towel-lined plate to drain. Repeat until all of the potato mixture is used, adding oil to the skillet if needed between batches if needed. Oh my goodness, I’ve been looking for this recipe (one that I enjoyed) EVERYWHERE. Is there any gluten -free flour you’d suggest using? Thank you! I *think* chickpea or oat flour would work, but I haven’t tested them out so not 100% sure! You might need to adjust the amount if you use either one, so I’d add just a bit at a time. Enjoy!! There are all purpose gluten free flours out there you can substitute cup for cup. Bob’s Redmill has one and I believe King Arthur does too. Awesome idea. I’m going to add imitation bacon bits and onion to mine and serve with ketchup. 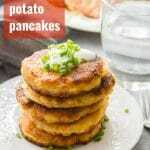 I know of potato pancakes but never would have thought of this. This is a great site I stumbled upon, and I am going to bookmark it. I look forward to more recipes.